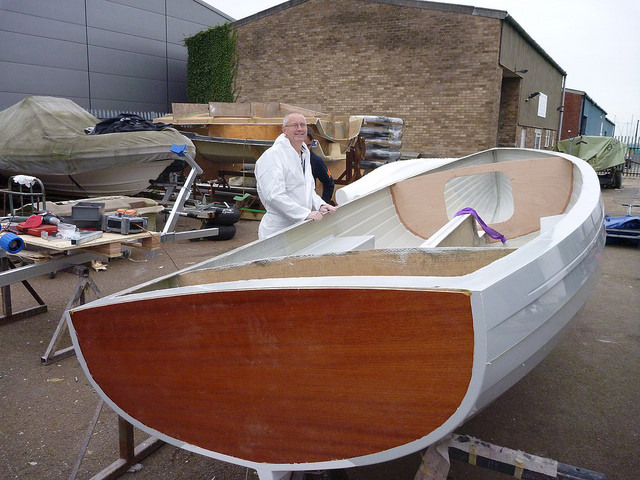 There’s been big excitement in BOD world over the past few days as the hull of Geoff Gritton’s new C56 Never Say Never emerged from the mould at White Formula and was transported to Simon Hipkin’s yard to start her fit out. As some of you already know, Geoff was for many years insistent that he would never sail a BOD and he was often somewhat scathing about our beloved boats. Of course that was all before he had actually raced one properly, so our marketing team went into action determined to change his mind. Initially it was the odd request for him to crew in a boat, then the call came for him to helm C51 Grethe when Fi was away working, and finally Fi dragged him out to crew for her in Pyefleet Week 2015 (the most exciting BOD racing ever). Naturally, before the poor boy knew it, Geoff had been infected with BODitis, new build contracts had been signed, deposits paid and colours chosen. And what great colours they are. As you can see from our pics of the boat coming out of the mould she is a wonderful light smoky grey with red waterline and white bottom. Geoff is determined that C56 will be innovative and one of the first new ideas you can immediately see is the inclusion of a 4mm plywood transom panel incorporated within the moulding. 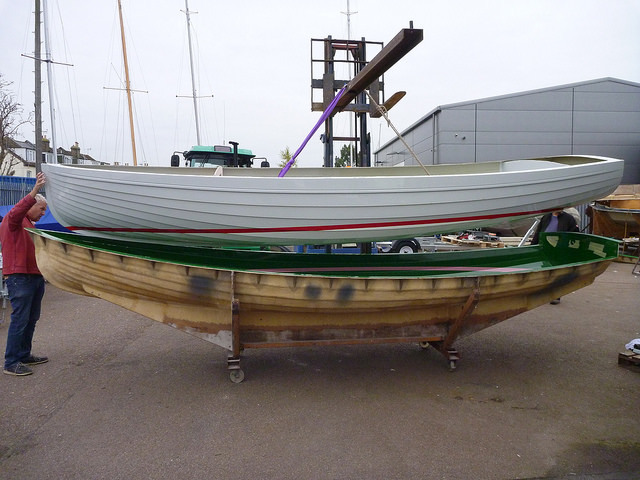 This is a fantastic addition and further enhances the traditional look of the new GRP boats. Geoff has a number of other innovations he is working on with the builders and class measurer David Chivers, and we’ll bring you news of these as soon as we are able. Geoff is aiming to be afloat by Easter 2016 and we can’t wait to welcome Never Say Never and Geoff and his crew to the BOD fleet. Geoff has created a great gallery of photos of the build which he will update regularly. Click here to follow the photo story of C56’s build.